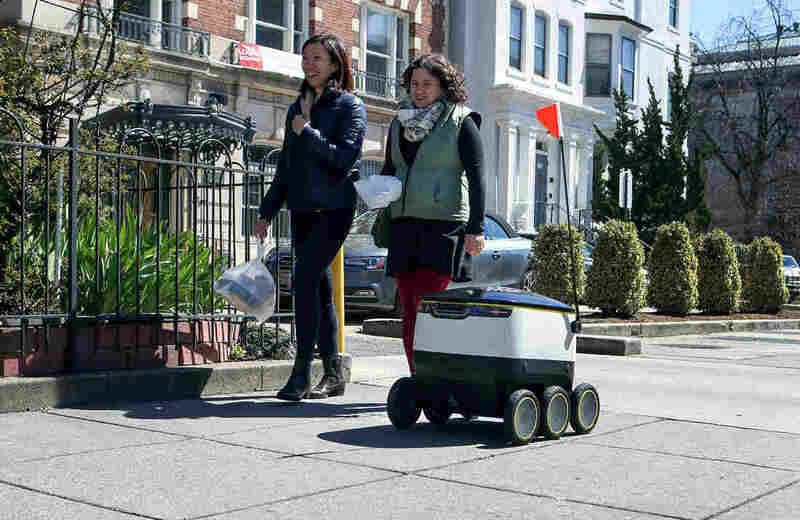 Robots Deliver Takeout Orders On The Streets Of Washington, D.C. : All Tech Considered Self-driving delivery robots have popped up on the sidewalks of Washington, D.C. — and other locations have expressed interest. The bots learn about traffic patterns with every trip they take. 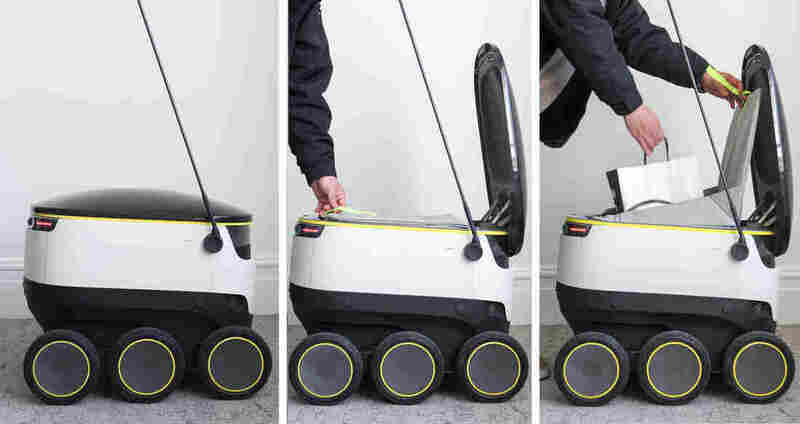 Starship Technologies' delivery robots, which can be found traveling the sidewalks of Washington, D.C., get smarter the more they drive — learning about sidewalk and traffic patterns with every trip they take. Here's a classic big city dilemma (sorry suburban folks): It's late at night, the weather is bad, and you're hungry. Your favorite restaurant is less than a mile away, but you don't want to leave the house, and you don't want to pay a $5 delivery fee — plus tip — for a $10 meal. Back in the old days, you would have braved the elements — or learned to plan ahead. 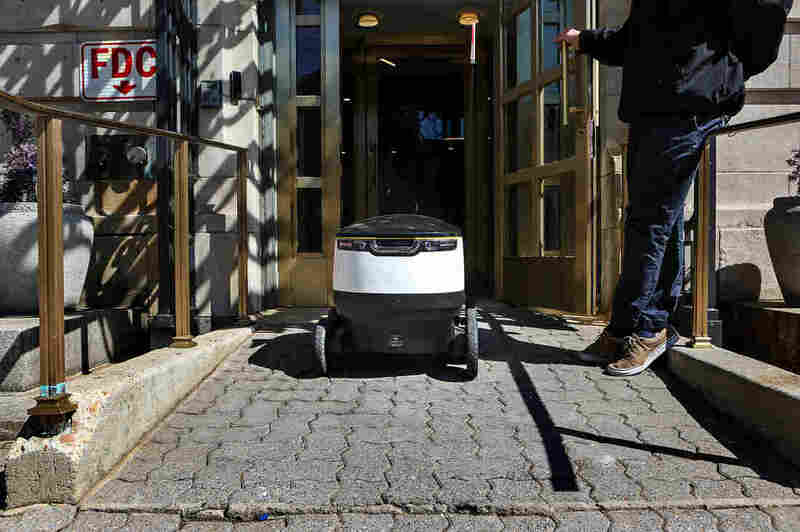 But those days are coming to an end, at least in Washington, D.C.
A fleet of about 20 autonomous, knee-high robots recently has appeared on the sidewalks of the nation's capital, and they're out to revolutionize hyper-local delivery in big cities. Their mission? Bring takeout food from restaurants to hungry customers at home — while keeping the delivery cost to around a dollar. The robots are European, created in Estonia by a company called Starship Technologies. The company is new, but its tech experience runs deep: It was founded by two of the co-founders of Skype, Janus Friis and Ahti Heinla. Each 35-pound bot is essentially a medium-sized cooler on six wheels, and drives at an average speed of about 4 miles per hour. It has lights and a tall, bright orange flag to make it more visible to pedestrians on the sidewalk. A smartphone app unlocks the shiny black lid to access the hollow, insulated holding area, and then automatically locks back into place. 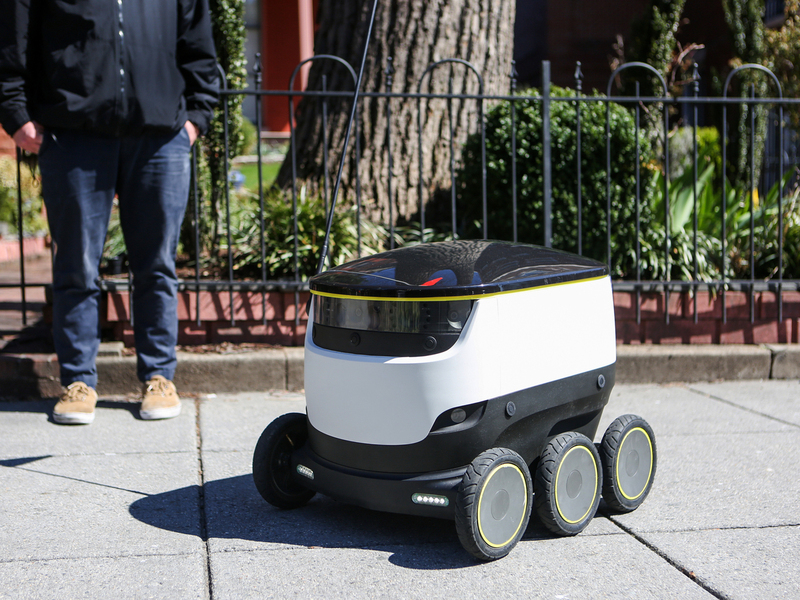 Here in Washington, Starship has teamed up with Postmates, the online delivery service, and the robots already are completing deliveries around the city. We wanted to see how they work, so we met up with Nick Handrick, the director of operations for Starship in the District, to go for a walk with one of the little bots. "It's pretty small, pretty cute," he says, as we wait for the bot to get a new set of coordinates for the journey. This is just a test drive, but in an actual delivery, those coordinates would come after a consumer had placed a delivery through the Postmates app. Suddenly, the robot begins to move, almost silently. It's electric, so there isn't much sound aside from the quiet hum of the wheels on the pavement. The bot moves like a giant remote-control car, except there's no remote. It's driving entirely on its own, navigating the sidewalk using artificial intelligence technology that draws input from nine cameras all around the rim, GPS, and sensors that can help identify the speed of pedestrians in the immediate area. The bot's cameras recognize a lot — including walk signals and traffic lights, crosswalks and stop signs, Handrick explains. And they get smarter the more they drive, learning more about the sidewalks and traffic patterns of busy streets with every trip they take. And, Handrick says, if a bot finds itself in a situation it doesn't understand — an unfamiliar driveway, for instance, or next to a parked car with flashing lights — there's always a human operator monitoring things, so all the machine has to do is send a call for help. The human on the other side can look through the cameras and figure out the best action to take. The catch? That human might be all the way in Estonia, at the original Starship Technologies headquarters — so if your late-night takeout delivery gets stuck, it could be someone in another country who helps get things back on track. That camera and human combo also provides security. If someone tries to steal the robot, for example, an alarm sounds and the operator can speak through two-way speakers. The cameras can photograph the thief, and there are multiple tracking devices that can track the bot's location. And the bot won't work or open unless you reprogram it — which Handrick says isn't easy. "It will be an embarrassing day for the person who decides to try and take one," he says. "You'd be stealing a beacon for the police to follow us right to you." The robots have only been in Washington for about a month, and they're still causing quite a stir, often getting stopped for photos. While we're walking, Maria Garcia is on the sidewalk, pointing out the robot to her 2-year-old daughter. "It's super cool," Garcia says. "The only thing I worry about — is it going to put people out of jobs?" Russell Cook, the director of operations at Postmates, says absolutely not. The company sees robots as a supplemental form of delivery, not a replacement, he says. 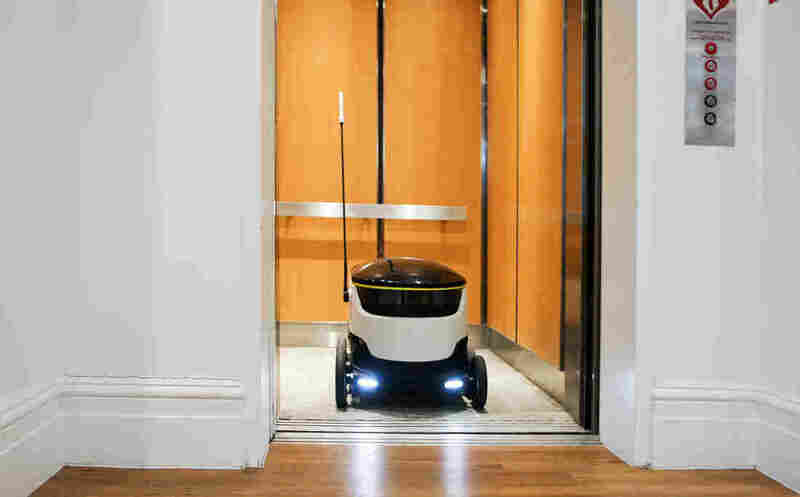 Robots like these ideally will complete deliveries that normally wouldn't have been placed with the human-based delivery options of the past. "We have people that drive cars, they walk, they bike, and we see robots as another type of vehicle that enables a whole bunch of different things from a delivery perspective," Cook says. Legislation has passed to make self-driving robots like these legal on the sidewalks in the District of Columbia and Virginia, and similar laws are in the works in Florida and Idaho. Other states also have expressed interest. But for everything these robots do have, there is one thing they're lacking — a name. This bot we've been walking with is simply called 6D57. Handrick says Starship is constantly asking people for suggestions. Got an idea? The company would love to hear it.